Mariposa Homemade Ice Cream is located in the heart of Normal Heights, in San Diego, California. 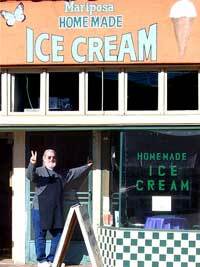 We make and sell all of our Ice Cream, Sherbet and Sorbet in our shop on Adams Avenue. For the past 16 years, we've been winning awards for the Best Ice Cream in San Diego, and have been highlighted in the New York Times as a must-visit when in San Diego. San Diego, by San Diego magazine. No gimmicks, no need for expensive mix-ins, just good old-fashioned ice cream, served by the people who make it.